Apples are rich in antioxidant compounds called flavonoids that combat free radical damage and inflammation. They are the highest natural source of an unusual flavonoid called procyanidin B2 which research studies suggest stimulates hair growth by activating the anagen (growth) cycle of your hair follicle and decreasing the dormant phase. Most of the flavonoids in apples like procyanidin B2, epicatechin, quercetin and others are found in the skin, particularly of red apples like Fuji, gala and red delicious. Unfortunately, conventionally grown apples are often sprayed so using organic fruit is highly recommended where possible. If you can’t find organic apples then get a small scrubbing brush, pour a little apple cider vinegar over it and scrub the fruit’s skin well. This should remove most of the pesticides and waxes and make them a healthier addition to your hair growth smoothie. Hair is made of keratin which is a protein. A good daily supply of amino acids from protein rich foods is not only important for maintaining muscles, it can have also have a big effect on the strength and quality of your hair. Whey is a potentially great source of complete protein for healthy hair, but the quality can vary dramatically depending on how it is sourced and produced. Cheap whey, made from feedlot cattle milk and heavily heated, is a far inferior product to this highly nutritious grass fed organic whey I use. It is made with a special low temperature filtration method that maximizes the bioavailability of lactoferrin, immunoglobulins, cysteine for glutathione production and a number of other valuable nutrients for enhancing your health and well-being. Cooling, hydrating and alkalizing, cucumber is great for your skin but also beneficial for hair growth due to its high levels of silica. This mineral is an important nutrient for hair formation, yet many people eating a processed food diet are deficient in it. Like apples, cucumbers can have both sprays and waxes on their skin so scrub them well with apple cider vinegar and wash them in hot water if they are not organic. Avocados are particularly high in monounsaturated oleic acid that nourishes your hair follicles and helps to create shiny and resilient strands and prevent split ends. Using creamy avocado in this hair smoothie also whips it up into a rich, fluffy and almost dessert mousse like consistency. Extra-virgin coconut oil is another great source of healthy fats for nourishing your hair and scalp. Many people notice an improvement in the softness and shine of their hair when they start adding coconut oil to their diet regularly. A high quality organic coconut oil, like this bestseller, also makes a great hair treatment that not only improves hair’s texture and appearance, it also combats dandruff, dry hair and itchy scalp. Parsley is full of nutrition for both your hair and skin with high levels of vitamin K, beta-carotene and trace minerals like iron, zinc and copper, associated with preventing gray hairs. Research has also discovered that the flavonoid apigenin found in parsley stimulates hair growth. There’s much more on why parsley is so good for your hair and skin here. Flaxseed is the highest natural source of omega-3 alpha linolenic acid and a valuable superfood for better hair. Flaxseed oil can be used instead if you prefer, but ground flaxseeds add a satisfying nutty flavor to this smoothie recipe for hair and also make a great base for healthy homemade muesli. When getting flax it’s important to find a fresh and organic source, always keep it in the fridge and use it regularly for ongoing skin and hair benefits. For a smoothie recipe like this, where you are trying to increase healthy fats in your diet for beautiful hair, my preferred ‘milk’ would be a half and half mixture of delicious coconut milk and water. Coconut milk in a BPA free carton is safer and easier than cans so you can get just the right amount each time. Other good options would be organic hemp milk or almond milk, coconut water, fermented kefir or unflavored bio live yogurt. Estrogenic soy milk and conventionally produced cow’s milk with hormone and antibiotic issues and allergenic compounds are best avoided. This smoothie recipe already has some serious nutrition for healthy hair but the following three ingredients will really enhance its potential as a natural hair growth treatment. Black currant seed oil is the highest natural source of gamma linoleic acid which is often recommended for hair growth and preventing hair loss. It is also rich in omega-3 alpha linolenic acid and you can read about how it stimulates hair follicles and combats androgenic alopecia here. Raw pumpkin seeds are a natural DHT blocker and particularly good for preventing male pattern baldness and hair loss. Women’s hair can also benefit from the high levels of minerals and healthy fatty acids found in pumpkin seeds. The famous Chinese traditional medicine treatment for preventing gray hair, powdered he shou wu can easily be added to all your smoothie recipes if you are concerned about graying hairs. 1 apple, scrubbed and chopped into a size your blender can handle. 30 grams of organic grass fed whey. A tablespoon of organic extra-virgin coconut oil. Half a medium size cucumber, scrubbed and chopped. 2 tablespoons of fresh organic flaxseed meal or 2 teaspoons of organic flaxseed oil. 2 branches of parsley, washed and with the stems chopped into half an inch or less. Half coconut milk and half water or other healthy milk to two thirds as high as your ingredients in the blender. A few drops of concentrated liquid stevia if you prefer a sweeter taste. 1 teaspoon of black currant seed oil or take equivalent capsules at the same time as the smoothie. 2 tablespoons of raw pumpkin seeds. 1 teaspoon of powdered he shou wu for preventing gray hair. Start by scrubbing your apple and cucumber with apple cider vinegar. Rinse with hot water and chop up the cucumber and apple and throw them in your blender. Wash the parsley and throw in the fronds. Depending on the quality of your blender you might need to chop up the stalks quite thinly. I never bother having this powerful blender in my kitchen, but for low powered machines it will be best to chop them into half an inch or less. Scoop out your avocado and coconut oil and throw them in. Add your whey, flaxseed meal and any optional extras. Fill your blender jug up to around half way with your milk of choice. Add a few drops of stevia into the liquid if you like your hair smoothies a bit sweeter. Turn on the blender and blend it until the consistency looks smooth. Drink immediately for the best taste and most benefits for your hair. This hair smoothie can make a healthy breakfast or late afternoon pick me up to ward off hunger if you are having a late dinner. Any time that suits your schedule is fine as long as you are giving your hair the nutrition it needs regularly. While hair does take a long time to grow, using ingredients like these in your smoothie recipes should definitely improve the quality, thickness and appearance of your hair over time. If you are looking for more immediate results, these avocado oil hair treatments or flaxseed oil hair mask recipe can be made at home and are a natural way to quickly improve your hair’s softness and shine. Do you have any other healthy ingredients you’d suggest adding to this smoothie recipe for hair growth? I be interested to hear your opinion and suggestions if you make it up for yourself. There’s even more rich tasting smoothies for improving your health and appearance here. It’s a different type of medicine and if you have them regularly you’ll be amazed with the results. Thanks for the informative post. Very well explained! I shall make the hair growth smoothie at home and come back to you on how well it works. However I would like to know I I can use the whey that is made at home when we Indians make paneer at home. Also we do not get that substitute of sugar that you mentioned. So can I substitute it with a tad bit of honey. Whey should be fine and a small amount of honey, preferably raw, is much better than sugar. Thanks Jim for this recipe. I recently started nutriblasting and really enjoying the boast of energy. I will sure use the recipe you suggested for healthy hair. Please can you let me know how best to use papaya seeds and avocado seeds. I understand that both seeds have nutritional benefits. Thank you so much for the info you give on your site. And I am so hook on your YouTube . Superfood profiles plz., plz continue to inform us about all these good and healthy foods.i was one of those people that was eating garbage . Am 52. Was weighing over 186 1bs but I wake up in time. Now I an 159 1bs and loving it……..stop eating a lot of things only eating fish , lots of veggie. Lots of smoothies and fruits an of course . Most of the superfoodand herbs from your info. I do a lot of reading and research now. My question to u is what is the difference between fo -ti root powder and he-shou- wu powder. Thank you very much and keep up the good work u are doing. How long will it take to download the free e book for hair growth? I clicked on it but it still hasn’t arrived. Thank you so much for your interesting e-mails. I love using natural ingredients for everything. My Doc thinks I/m mad but he has to admit that a lot of the things I use when I’m sick actually work so, please keep your letters coming. Thanks for your wonderful smoothies for hair growth, how many times will you recommend this a week. Hi Christina and thanks for your positive comments. Thanks Remi. 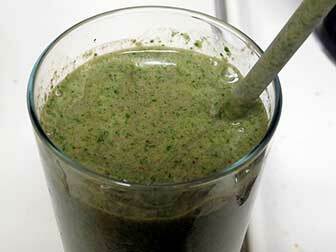 Twice a week or every 3 or 4 days would be a good regime to make the smoothie. I’m sorry it didn’t work for you. You can download or open the better skin ebook with this link https://superfoodprofiles.com/wp-content/uploads/7-Superfoods-for-Beautiful-Skin.pdf The first few emails are on hair and there will be more in future. Glad you like them. i would like to ask you how many days in a week should i drink this smoothie? be edible. I’m in Australia> Would you steer me in the right direction for this. Generally the more often the better and it makes for a very healthy meal replacement. That said, I’d still expect beneficial results with twice or even once a week dosage. I wouldn’t use a skin care oil unless it says food grade. Having capsules is another option as black currant oil is quite potent with it’s GLA. If you use them then ideally you could have the hair growth smoothie in the morning and the capsules with an evening meal. Often the ingredients will separate and if there are fruits with enzymes or that oxidize the smoothie probably won’t be that good the next day. An alternative is to freeze any remainder and have it as a frozen treat some time in the next week or so. What about pearl powder? Can it be used with this smoothie? Pearl powder would be a good addition. Thanks for the valuable article. I hope these smoothie tips help me to grow back my hair again.